The last stage requires a permit from NSW Parks, which can be obtained from their office in Merimbula (02 6495 5000). It takes you through the most isolated parts of the south coast, so pack your tent as you head off into the Nadgee wilderness Area. There are two possible routes out of Wonboyn, inland or via the coast. The inland route takes you up into the forested hills behind the village to pick up the dirt access road that leads to the old Merrica River ranger station, reached by a suspension bridge across the river. For the coastal route you retrace your footsteps down the $WD track towards the coast,turning off to reach the shore at Greenglades. Here a faint foot-track, marked by pink ribbons leads you over a heavily timbered headland to the mouth of the Merrica River. Its tranquil lagoon can be waded to reach a sandy campsite on the far shore, from which a foot-track, then dirt road take you up along a ridge beneath the forest of the Nadgee Nature Reserve. This meets up with a fire trail near Tumbledown Mountain, where you rejoin the inland route. A steep winding descent down the fire trail takes you towards Newtons Beach, walking beneath the vines of coastal rain forest to cross a ford at Wirra Burra Creek and reach a grassy clearing that provides a possible campsite. Climbing out of these lush coastal flats into a paperbark heathland, the route continues southward. Crossing a series of dry creekbeds amongst the dense, head-high heath, you finally emerge at the beautiful Little River Estuary, with its waters edge campsite overlooking the sandy bar to the ocean. A short but tricky passage around the rocks brings you to the sandbar, before climbing up into the paperbark and banksia heath behind the low line of cliffs. After a few kilometres you turn inland to follow an old disused road towards Harry’s Hut on the Nadgee River, a more likely source of fresh water than sticking to the coast. The forest becomes taller and more lush as you approach the hut, final reaching the river and its fern-covered banks. You reach the hut in its tiny clearing on the other side by crawling across a fallen log – it is a good place to take a break. From the hut, the track takes you back towards the coast, crossing the low heath of Nadgee Moor to emerge at a wild and isolated section of beach and the broad sand bar blocking Nadgee Lake from the sea. From the southern end of the bar, a foot track climbs up into the low heath of Endeavour Moor. As you approach Cape Howe, the track becomes increasingly vague in parts and at times tunnels its way beneath dense thickets of paperbark to finally emerge at Bunyip Hole, a pleasant waterhole set in a depression in the moor. 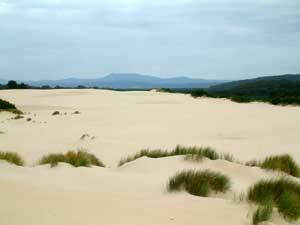 It is but a short stroll from Bunyip hole to the beach, where you can see the massive sand dunes of Cape Howe. As you cross these dunes, you pass a concrete pillar marking the border of New South Wales and Victoria, before regaining the beach a little further on near Conference Point. Following alternatively sandy and stony sections of beach, you reach Lake Wau Wauka, a large coastal lagoon, with a lovely campsite on its shore. You are now on the Big Beach and all that lies between you and Mallacoota, 20km away is this long stretch of sand. It is time for meditation on the walk that you are about to complete, as you wander down this pristine coast – off shore the lighthouse of Gabo Island keeps its watch, while a short detour inland over the dunes is worthwhile to enjoy the setting of fresh water Lake Baracoota. Finally you reach the neighbourhood of Lake Mallacoota. In the rare chance that its entry is barred you can walk right into the town of Mallacoota on its southern shore. More usually, you will have phoned ahead to arrange for a boat to pick you up at the jetty on its northern shore and take you on a pleasant cruise to the end of your walk. For a walk that has so many water-crossings as a feature, this seems an appropriate way to end the section and The Great South Coast Walk. 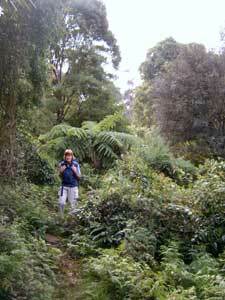 The route here follows that of the Nadgee-Howe Wilderness Track. It should be noted that a permit is required from either NSW environment and Heritage or Parks Victoria to camp in this region. It should also be noted that Mallacoota Lake is rarely closed off (although it was so when we walked into Mallacoota 12 years ago), which means that a boat trip is needed to finish or start the walk. The National Parks people at Merimbula and Mallacoota can provide contact details of people who will do this. The access track between the beach and the boat pick-up/drop-off point needs to be added to this site.